The show began with a recap of the Bound For Glory pay-per-view and ended with a major push for Brian Cage, in an attempt to establish him as a top star. 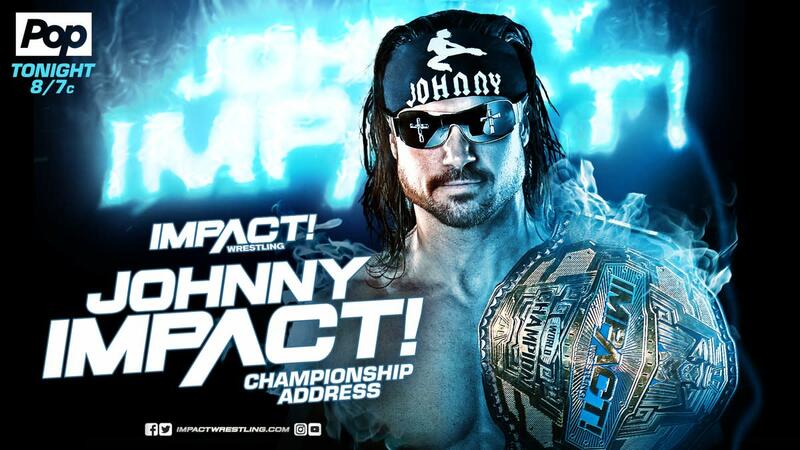 New World Champion Johnny Impact kicked off the show. The crowd chanted “You deserve it,” treating him like a legend. The crowd looked really small, maybe 200 people or so, most of which were standing. The ring also appeared smaller than a conventional-sized ring. Impact talked about his film career and said he was proud of it: “If I want something I go for it.” He also said every kid dreams about being a pro wrestler. Fenix interrupted Impact’s self-congratulatory promo. Fenix said he has won World Championships in other places, but never in Impact. He challenged Impact to a title shot next week. Impact accepted. Tommy Dreamer issued a challenge to Moose in a backstage interview. A few minutes later, interviewer McKenzie Mitchell caught up with Moose and Killer Kross. Kross accepted Dreamer's challenge. Slow-paced match. Katarina hit a DDT for a near fall and then pounded on Valkyrie. During the match, Josh Mathews announced that the show was moving to 10 p.m. Eastern time next week. Valkyrie rallied and won with a chicken wing front slam. McKenzie Mitchell interviewed Valkyrie after, with Valkyrie saying that she doesn’t respect Tessa Blanchard because she cheated during their title match at Bound for Glory. We got two on-location segments, filmed at night. Matt Sydal and Ethan Page talked about being at peace despite their loss at Bound for Glory. After that, Gama Singh was verbally abusing Rohit Raju again, this time challenging him to a match next week, as the final test for the Desi Hit Squad member. Lee, with his long black hair and rugged look, has a great presence. Mathews pointed out that Lee doesn’t win a lot of matches and Don Callis said he was committing mental mistakes. Sydal was at ringside cheering his friend on. Page spent the match pointing to his third eye. There was a backstage interview with Rich Swann and Willie Mack. Swann challenged Brian Cage to an X Division Championship match. They recapped the dreadful Lucha Underground-esque segment with Allie, Su Yung, Kiera Hogan, and Rosemary from Bound for Glory. They also advertised Chris Jericho’s cruise. The Flashback Moment of the Week featured Eric Young defeating Magnus to win the TNA Championship. This was a brief segment for a change, about one minute, rather than showing the entire match, which is what they typically do. Backstage, Petey Williams approached Scarlett Bordeaux about her talent search and Bordeaux blew him off, saying that her search has extended beyond Williams and wrestlers and now includes any member of the public. Dreamer brought some psychology to the match. In one spot, Dreamer took a drink of water and was going to spit it into Kross’ face, but Kross picked him up and suplexed him onto the railing, forcing Dreamer to spit the water into the air instead. Moose got involved from the outside, choking Dreamer when the referee wasn’t looking. Kross pounded on Dreamer inside the ring with power moves, significantly slowing the pace to the point that it resembled a Baron Corbin match. Kross went to the top rope, but Dreamer caught him and superplexed him. The crowd chanted “ECW.” Dreamer hit a Diamond Cutter. Moose jumped into the ring. Dreamer hit Kross and Moose with a simultaneous cutter and neckbreaker. Dreamer hit Moose with a kendo stick, allowing Kross to sneak behind him. In an odd ending, Kross hit two Saito suplexes and the referee stopped the match. Moose and Kross then double-teamed Dreamer after the match and then stood above him. No sign of Austin Aries. Next was an interview with Eli Drake. They showed a clip of Abyss chokeslamming Drake through a table. There was no mention of Drake’s opponent during the match, James Ellsworth. Drake said he was going to sue Impact Wrestling for putting him in an unsafe working environment after Abyss put him through a table. There was an on-location segment featuring LAX celebrating at a bar after defeating the OGz at Bound for Glory. King briefly interrupted, but then walked away after Konnan told him to leave. Allie has new, dark hair and a more aggressive persona. Allie was wrestling like a possessed person. Her tag team partner Kiera Hogan was shocked at ringside. Allie got the win with a codebreaker, in a match she dominated. “This is a very dark and disturbing Allie,” Callis said. Allie pounded on Alisha after the match and Hogan interrupted and tried to break it up. Allie then seemed to break out of her trance and show guilt for her wicked display. The crowd was not into the match. Cage is truly a unique guy in the industry. He's huge and jacked but can fly like a cruiserweight. His left leg was bandaged up. He had most of the offense in the match, pounding on Swann, and not executing many of his usual high-flying moves. They botched a move at the end where Cage didn't quite catch Swann after he dove from the top rope, but they corrected it quickly. Swann is really good too, although sometimes it looks like he is just going through the motions during his Impact run. Cage hit a pumphandle slam for a near fall. He went for a powerbomb, but Swann jumped out and kicked him. Cage grabbed him and suplexed him for a near fall. Cage tried to slam Swann from the top rope, but Swann countered and kicked him. Swann hit a cutter from the top, then another springboard cutter. Swann then hit a 450 splash off the top rope for a near fall. The crowd chanted "this is awesome," proving that some fans in 2018 just want to see near falls. Swann went for a Phoenix Splash off the top rope and missed. Cage hit his Weapon X for the three count. This was a solid match that re-established Cage as a top guy, even though he was pinned in a tag team match at Bound for Glory by Sami Callihan. Callihan came to the ring as Cage was celebrating and the two had a face-off. Callihan kicked Cage's thigh, but Cage countered and clotheslined him. Dave Crist ran to the ring and received a piledriver suplex. Callihan and Jake Crist then pulled Dave Crist to the backstage area as the show went off the air. Mathews reminded the audience that the show begins at 10 p.m. ET next week.